As head mixologist for The Cosmopolitan of Las Vegas, Mariena Mercer is known for creating inspired libations that have made the center-Strip resort’s bars and lounges must-visit destinations among travelers and locals alike. From the taste bud-morphing Verbena to the misty magic of her Spocktails, Mercer’s creations are as pleasing to the eyes as they are to the palate. It’s no surprise, then, that when it comes to celebrating the holidays, Mercer’s talents particularly shine. She crafted an entire menu of specialty cocktails and mocktails for The Ice Rink at The Cosmopolitan, which includes such concoctions as Egg Noggy Nog (a steamed house-made eggnog spiked with Old Forester bourbon) and Campfire Delight (which is basically s’mores in a glass). But one thing you won’t find on any menu at the resort is Mercer’s bubbly-infused Poinsettia Punch recipe, which uses one of Mercer’s signature ingredients, Oloroso sherry. Mercer’s take on this modern classic is, not surprisingly, all about presentation. At home, she likes to serve the holiday punch in one of the antique bowls found on her travels, but she admits “any bowl will work.” Although Mercer says the punch recipe is “super simple,” she adds a “wow factor” with an icy fruit ring that is both functional and fabulous. 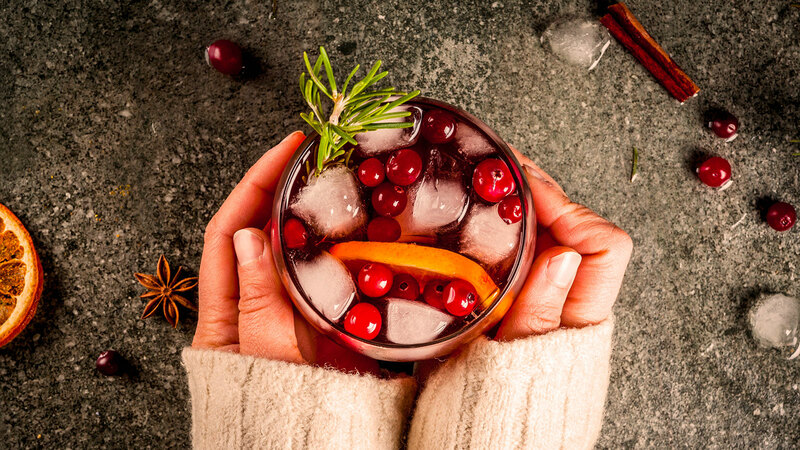 In a large bowl, stir together the cranberry and orange juices, sherry, prosecco and Grand Marnier. Line a Bundt cake pan with some of the blood orange slices, cranberries, and rosemary. Add crushed ice and pack it in. Place in a freezer until frozen through and then add water to fill in. The fruit and herbs should gather at the top. Dip in warm water to remove. The ice ring should come out in a beautiful, single wreath. Place in punch bowl and pour punch on top. Float in the remaining blood orange slices, cranberries, and rosemary sprigs.